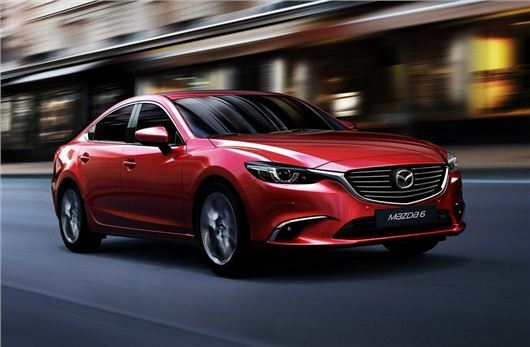 A revised Mazda6 range is on the way with styling tweaks, improved ride comfort and higher standard equipment levels across the range. The updated models go on sale in early 2015 with prices starting at £19,795. While the exterior changes are minimal, inside there's a new instrument panel and centre console. The big changes come under the skin with improved sound insulation and revised suspension. Standard equipment levels have been upgraded with SE and SE-L models getting an electronic parking brake. Alongside this is a new seven-inch colour touchscreen with DAB. Sport Nav models get a redesigned grille, new headlights and restyled LED tail lamps. A new head-up display is available which projects important information into the driver's forward field of view. A new integrated navigation system has greater accuracy, improved search features and three years of free map updates. Sport Nav trim comes with stone leather upholstery and an evolution of the Safety Pack. This includes land keep assist, a blind spot monitoring system and Rear Smart City Brake Support. This operates at speeds of between 2mph and 5mph when reversing, automatically applying the brakes if the system detects an imminent rear impact. Had an earlier Mazda 6 and was generally pleased with it, this current version that I have driven is a cracker and the facelift will only make it better. But, I currently have a Golf V11 and yes it has an electric handbrake, a totally unnecessary and extremely frustrating piece of equipment that has no advantage at all over a normal handbrake and many downsides, so why oh why would Mazda think this a good idea considering the amount of complaints and general dissatisfaction that VW have received over theirs.